Do interviews mean anything to you? Do you have to have a special state of mind when answering one ? Haskel : That means recognition for my work. I am glad to have chance to talk about my music, to talk about it to make people get desire to discover ! I feel comfortable cause I am talkative. Autarkeon it comes from the word autarkic why this name speak a bit about the meaning ? Haskel : This is an invented word. 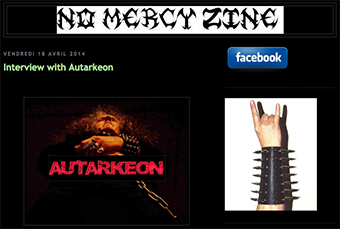 Autarkeon is a one-man band, right? Do you feel comfortable with this? Might it be possible to see some additional musicians joining your rank in the future ? Haskel : Yes, it is a one-man-band. There is only one person working with me, it’s Spike, whom I talked about before. She performs mixdown and mastering, edits videos. In short, everything that is technical. Except recordings, that I do by myself. Working alone (almost) is the best way for me. I am autodidact also. I wanted to include all of this in the concept of autarky. The ”Autarkeon” is his own master, his own guide. It might sound self-important, snooty. I haven't any trouble with that. I am not perfect. I make mistakes, as everyone. But I am learning by my-self. I take my failures. What I succeed is due to my work. What made you decide to start a one man project ? Haskel : I used to play in garage bands, many years ago. There were too many things to take care at once. Character, taste, way to work, availability of each one. The more people you are, the more difficult it is. Most often a natural leader emerges; he federates more or less. Unfortunately sooner or later dissent grows. When the band contains two leaders or it is made of several strong personalities, the project may turn more quicker to failure. Otherwise the band works on a way of compromise. And that would be a trouble for me. So, in short, I am working alone cause I like it. According to my methods, my desires, and my pace. Are you also busy with some other projects/bands ? Haskel : No, I don’t. I imagine I could release songs under another name, if I had some that don’t fit to AUTARKEON. I have no side project for now. Do you consider AUTARKEON to be a band or a project ? Haskel : I don’t like the word « project ». At least in its French meaning. A project is something you are going to do. Something you are thinking about or just a draft. But « band » doesn’t really fit. Except if you consider I am working in team with Spike. By her work, she gives color, emphasis to my music. What music do you generally listen to ? -Haskel : Metal, only Metal. There is everything in Metal : every ambiences, every spirits. Melody and brutality. Basic compositions, tribal. Works developed as in Classical music. In what part of France do you live? Is it attractive for tourists? What can you recommend ? Haskel : An Area called “Region centre”, although it isn’t really le middle of the country. How is the metal scene in France ? Haskel : The situation has always been incomprehensible, paradoxical. There is a huge public for Metal. According to a lot of foreign groups, the French public is one of the best. Yet even the most famous bands make shorter tours in France. Profitability issue. Tours boil down to a single date in Paris. They make sure that it will be sold out or almost. Meanwhile French bands have to make their proofs abroad before being recognized in France. Nothing to do with German or Spanish unconditional support to their bands. I read in a magazine, that in the eighties, one of their famous bands filled a stadium. We were far away from this in France. And the issue of lack of support to French scene is still right today. Hard to explain this French exception. The reasons are many. How did you get the inspiration to do music ? Any bands or albums that did it for you ? Haskel : I have no recipe ! Sometimes I have fun by playing anything. I play dreamily. I improvise. And something interesting comes : then I go further too. Or, I get an idea while listening to music. I imagine another version of the song I am listening to. So I work on this digression to create my own song. How you define your style of music ? Haskel : First I didn’t care to define AUTARKEON’s style. I thought it was too reducer. But not doing it brought me disillusions ! How do you describe the music and the title of your "Demo 2011" ? Haskel : Death Old School first. Thrash or Black influences on some songs. Your first demo was raw, I think there are just the drum programming not fit with black metal why do you not play drums think if you will play drums the sound will be like some true black metal music ? Haskel : As I told before, AUTARKEON isn’t a Black Metal band. That is not really drums programming. I used sound bank, I mean real sounds of kick, snare, tom… The real trouble was mixdown and mastering. Fortunately I met Fred Uniwëria Zëkt through facebook. He really listened to my demo and had been able to feel a potential whatever the sound was. He has been able to guide Spike to improve mixdown and mastering. Great thanks to Fred ! Why do you not play drums ? Haskel : Learning guitar takes me a lot of time already. I’ve been starting learning it quite late. As I played in garage bands, I was only a singer. I would have loved to play drums. The thing is I lived for a long time in flats. It’s hard to train to play drums in those conditions ! Because of space and noise ! Speak a bit about your lyrics: the subjects it deal with, influences, the way it's written ?and how was your self recording of your demo are you satisfied ? Haskel : My songs are made of two types of lyrics. Lyrics which denounce dysfunction, violence, injustice, indoctrination in the world. That’s not very original, that’s true. I don’t pretend to change the world. I describe it. I externalize that’s it. The track Caligula it‘s about what ? Haskel : About Roman Emperor Caligula. It’s metaphorical too. It’s about human being generally and its bad instincts. Its dark side that prevent him to raise spiritually, to get to a superior level of conscience, knowledge, wisdom. About its faults, vulnerabilities which make human being a complex and sensible thing too. Which label would fit your music ? Haskel : A label that requires nothing : No delays, no touching up. Can you write a few words about the cover artwork of your demo? How does it fit together ? I see it’s poor ,I wonder what it means ? Haskel : Each can interpret it as he wants. It’s a suggestive picture, not a descriptive one. When you think of the people who enjoy your music, is there any particular thing ? I think it’s justified that people take interest in my music. Because I‘ve worked a lot, for years. And according to my mind, work must pay. Because I’ve been waiting for a long time to be recognized. Because I think I have the right to have a place too (if only geniuses had the right to display, record stores would go bankrupt. YouTube would be a top-secret media and concerts would be extremely rare) At the same time, I'm still (pleasantly) surprised by the positive enthusiastic feedbacks. As if I was talked about something familiar but which I am not the author. Something that does not belong to me. Which I'm just the promoter. Have you ever played live or do you plan to do so? Haskel : I did a single time. As a singer for a duo. It was with a friends’s band. You see some additional musicians joining your rank in the future ? Haskel : Honestly, I don’t know. There are two important things : musical and human compatibility. Both aren’t always linked. In case someone is interested in your music, how and where can this person buy your stuff ? What is your daily consumption amount of alcohol,cigarettes.... ? What are some of your non-musical influences ? What is your occupations outside Autarkeon ? Haskel : Sports. I gym, run, fight… I don’t practice Krav Maga anymore for a few months… Lack of time. What kind of music do you play in your car? What car do you own ? What are the future plans of Autarkeon any split or compilation, promo……. other things ? Haskel : My new demo is now available as I said. I am going to work on videos to promote my work. The next should be “Labyrinthe”. What is your greatest wish for Autarkeon ? Haskel : Increase my audience, that’s it. I have no unbounded ambition. What are you doing in daily life? How do you earn your money? Haskel : I don’t want to talk about this or about material things (like talking about my car…). What is your guitar arsenal (axe/strings, amps, effects) ? Haskel : Skull Strings Drop C; Pedal Metal zone Boss and Amp CUBE Roland for training. What instruments do you use ? Haskel : It is very simple. I use especially a Ibanez “RG series”. My bass is a Yamaha. Thanks for answering my questions bro soon , any particular messages or any closing notes , last words are yours ……..eternal hails. Haskel :AUTARKEON can only exist through your support !